Ursula—who Poirot has just called “Ursula Paton”—begins to weep. Caroline embraces her, murmuring, “there, there.” Ursula says she has read the report of Ralph’s arrest, and has decided to stop pretending. Poirot sheepishly mutters that not all newspaper stories are true, but nonetheless asks Ursula to tell the truth, in the hopes that her testimony can clear Ralph’s name. Poirot’s decision to plant a fake news story has clearly paid off: Ursula has come forward because she sees no further point in lying for Ralph’s sake. Poirot seems slightly embarrassed by his “trick,” but he urges Ursula to tell her story anyway. Ursula proceeds to tell Dr. Sheppard, Caroline, and Poirot what she’s been hiding. While working as a parlormaid for the Ackroyds, she fell in love with Ralph Paton and secretly married him—Ralph insisted that Roger would never let him marry “a penniless girl.” Ralph planned to pay his debts and announce the marriage to Roger—however, he fell deeper into debt instead, and Roger instructed him to marry Flora. Unwilling to push back, Ralph agreed. He saw marrying Flora as a business deal, designed to ingratiate himself to his stepfather and relieve his debt. On the afternoon before Roger’s murder, Ursula met with Roger and told him everything about Ralph. Furious, Roger dismissed her. Later that evening, Ursula met Ralph in the summerhouse, where they argued. Ursula says she hasn’t seen Ralph since that evening. Ursula’s testimony is important for a few reasons: 1) it explains the gold ring in the pond, 2) it explains why Ralph went to Fernly on the night of the murder, 3) it explains two of the people who were in the summerhouse, 4) it gives Ralph another motive for killing Roger, and 5) it explains why Roger took half an hour to talk to Ursula on the day of his murder—he wasn’t just firing her. Dr. Sheppard listens carefully to Ursula’s story, and realizes why she kept silent: had she told the truth, people would have thought that she’d murdered Roger before he could cut Ralph (and, in effect, Ursula herself) out of his will. Poirot then asks Ursula at what time she left Ralph in the summerhouse. Ursula answers that she arrived there around 9:33, and left about ten minutes later, returning to the house at 9:45. She remembers this very precisely, since her meeting with Ralph was so important. Ursula has remained silent about her marriage to Ralph to avoid incriminating herself. Now that she’s come forward, however, Poirot and Sheppard have a much more precise idea of the timeline of Friday night, since (perhaps a little implausibly) she remembers the exact minute when she visited the summerhouse. Poirot asks Ursula where she went after 9:45. Ursula claims she went to bed, but also admits that nobody can verify this. Poirot points out that Ursula could have committed the murder—a suggestion that Ursula finds terrifying. She points out that Ralph may have run away from the house after hearing about the murder and assuming that Ursula had done it. She also explains that she went to see Dr. Sheppard, assuming that Sheppard might know Ralph’s whereabouts and pass on her message to Ralph. Sheppard insists that he has no knowledge whatsoever of Ralph’s whereabouts. Poirot thanks Ursula and then tells her that the story in the newspaper is a mere “rien du tout.” Ursula looks confused, and Poirot quickly asks her to tell him if Ralph wore shoes or boots during their meeting in the summerhouse. Ursula says she can’t remember. At the end of the chapter, Poirot admits that he planted the fake story in the newspaper, leading Ursula to come forward; however, instead of saying this directly, he phrases it in a somewhat evasive way (“rien du tout” means “nothing at all”), so that it takes Ursula a moment or two to understand the implications of his statement. The chapter ends before Ursula expresses any anger with Poirot for lying to her. Also, notice that Poirot is now asking about whether Ralph wore boots at all—the color no longer seems to concern him. Arn, Jackson. 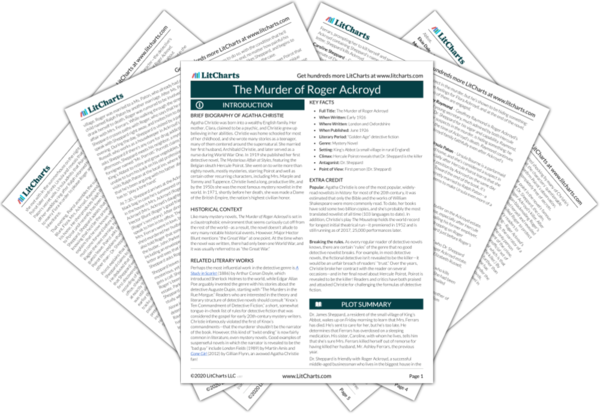 "The Murder of Roger Ackroyd Chapter 22: Ursula’s Story." LitCharts. LitCharts LLC, 23 Jul 2017. Web. 23 Apr 2019. Arn, Jackson. 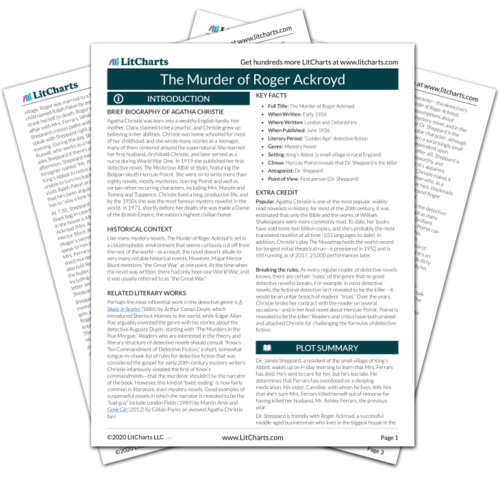 "The Murder of Roger Ackroyd Chapter 22: Ursula’s Story." LitCharts LLC, July 23, 2017. Retrieved April 23, 2019. https://www.litcharts.com/lit/the-murder-of-roger-ackroyd/chapter-22-ursula-s-story.